Eurasian magpies are common in many locations, but not where I live. Thus, they are more interesting to me than others. Especially interesting is that they are extremely intelligent (relative to animals in general). 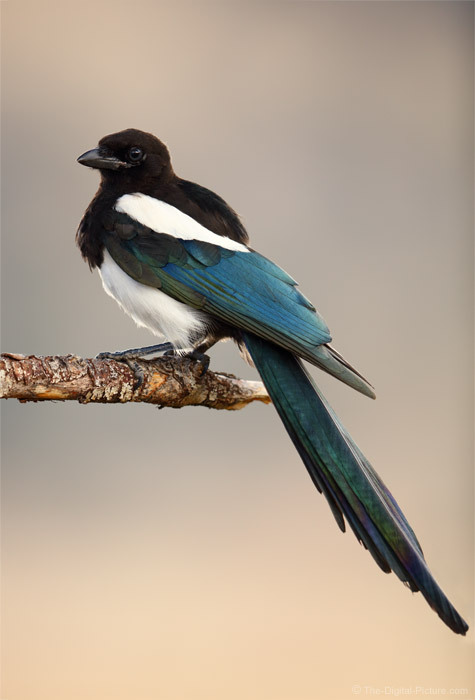 That these birds' loud calls can become annoying surely leads to local disinterest, but with their great colors and shape, it is hard to argue that magpies do not look amazing. Magpies are not a subject I have set out to specifically target with a camera, but I will take advantage of incidental encounters. When one landed in a tree in front of me as I was chasing elk in Rocky Mountain National Park, I went into opportunistic mode. I had the right lens in hand and all I had to do was adjust the monopod height, direct the camera at the bird, focus on the eye and press the shutter release. First, I like the head angle, turned slightly toward me with some sky reflecting in the eye to add life to the subject. I also like the body angle. While the bird may be turned very slightly away and that is not usually my favorite angle, in this case, that angle allowed the iridescent feathers on the wing to show their colors prominently. The tail was angled downward enough to fit in the frame (that can be an issue when photographing magpies) and with a slight toward-the-camera angle, the iridescent tail feathers also showed their colors. I was able to get to eye level with the bird (by quickly adjusting the monopod). The background was very distant and became completely blurred with a close subject photographed at 600mm f/4. With all details in the background eliminated, the bird stands out prominently. I also like that the lighting was very soft with a touch of rim lighting happening. Looking closely at the catchlight in the eye tells me this day was partly cloudy and that clouds were blocking the sun during this exposure. Unless flying, birds are on something – a branch, sand, rock, water, etc. In this case, that something was a dead tree limb. That this particular limb did not distract from the bird and even had a little character was a positive aspect. While Rocky Mountain National Park is an awesome location for elk photography, it offers much more. Including magpies.